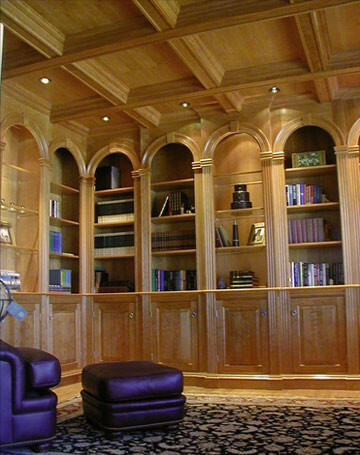 iCarpentry is a second generation woodworking business highly recognized for its quality craftsmanship. John Grover learned woodworking from his father, an expert in all aspects of building and construction. His artistic talent came from his mother, a highly accomplished oil painter. His formal training began at age 14, with enrollment in accredited college courses in art and design. After years of studying art in college, the decision to combine art with woodworking resulted in the start of a new business called The Spire. With higher goals and added skills the name transformed into iCarpentry. During the past 25 years he has worked as a reputable stair builder, furniture maker, high end finish carpenter and custom cabinet maker. His work, like his art, speaks for itself. iCarpentry remains a small company dedicated to producing the highest quality woodwork for your own personal museum. iCarpentry & Museum Quality is a registered T.M.